Power Systems Specialists supplies complete battery strings and individual replacement cells for UPS and DC Power Plants. We offer both sealed VLRA battery types and Wet cell lead acid battery types to meet your facility needs. In addition, we can offer long-life nickel cadmium batteries for Switchgear Station batteries and Generator start batteries. If you are looking at a redesign of your battery layout, we can offer battery solutions to fit your project needs. Flooded Wet Cell Batteries are used for long life with reliable performance in UPS systems and other high rate discharge applications. With proven battery designs, our battery manufactures have a battery design to meet your needs. When talking battery types, the most often used type of battery system in todays facility are sealed battery strings. A Sealed Lead Acid Battery for UPS and DC Power Plants is a specially designed battery that does what what a battery is know for, which is to be able to supply power on the loss of utility for a specific period of time. The benefit to the Sealed Battery systems versus the Wet cell system is less off gassing and with todays designs acid leaking has been almost totally eliminated. A Sealed Lead Acid Battery is commonly referred to as a VRLA battery. 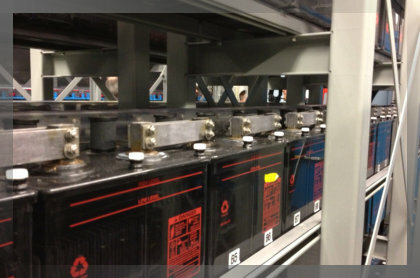 VRLA stands for valve regulated lead acid battery. We offer several different manufacturer’s batteries to meet your facilities needs. The Sealed Lead Acid Battery has to perform differently in a UPS application versus a DC Power Plant application. Because of this, the sizing of the battery becomes very important. Read More….